February 27, 2011 - The first production model of the Lockheed Martin F-35 Lightning II made its inaugural flight today in preparation for delivery to the U.S. Air Force this spring. The jet will head to Edwards Air Force Base, Calif., to support developmental testing shortly after the Air Force takes delivery. ?The aircraft was rock-solid from takeoff to landing, and successfully completed all the tests we put it through during the flight,? said Lockheed Martin Test Pilot Bill Gigliotti. ?The Air Force is getting a great jet that represents a huge leap in capability, and we?re looking forward to getting it into the hands of the service pilots in just a few more weeks.? 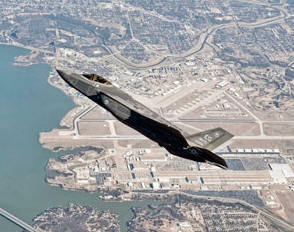 The first production-model F-35 Lightning II banks to the right on its inaugural flight near Lockheed Martin in Fort Worth, Texas. The supersonic stealth jet will be delivered to the U.S. Air Force this spring. The F-35A CTOL variant ? designed to meet U.S. Air Force requirements ? is also the primary export version of the Lightning II. The air forces of Italy, the Netherlands, Turkey, Canada, Australia, Denmark, Norway and Israel will employ the F-35A. The Lockheed Martin F-35 Lightning II is a family of single-seat, single-engine, fifth generation multirole fighters under development to perform ground attack, reconnaissance, and air defense missions with stealth capability. The F-35 has three main models; one is a conventional takeoff and landing variant, the second is a short take off and vertical-landing variant, and the third is a carrier -based variant. The F-35 is descended from the X-35, the product of the Joint Strike Fighter (JSF) program. JSF development is being principally funded by the United States, with the United Kingdom and other partner governments providing additional funding. It is being designed and built by an aerospace industry team led by Lockheed Martin. The F-35 took its first flight on 15 December 2006. The United States intends to buy a total of 2,443 aircraft for an estimated US$323 billion, making it the most expensive defense program ever. The United States Air Force (USAF) budget data in 2010, along with other sources, projects the F-35 to have a flyaway cost that ranges between US$89 million and US$200 million over the planned production of F-35s, depending on the variant. Cost estimates have risen to $382 billion for 2,443 aircraft, at an average of $92 million each. However, rising program cost estimates have cast doubt on the actual number to be produced for the U.S In January 2011 Defense Secretary Robert Gates expressed the Pentagon's frustration with the skyrocketing costs of the F-35 program when he said "The culture of endless money that has taken hold must be replaced by a culture of restraint." Focusing his attention on the troubled VTOL F-35B Gates ordered "a two-year probation", saying it "should be canceled" if corrections are unsuccessful. Private analysts say the whole F-35 program is becoming a money pit. "The incredibly unfortunate phrase 'too big to fail' applies to this aircraft more than any other defense program", said Richard Aboulafia, an aerospace industry analyst with the Teal Group.